If you are residing in the Philippines like me, then probably we have something in common in celebration of New Year's eve. Our Filipino Tradition in welcoming the new year is quite popular around the globe. That's why I take pride because indeed "It's more fun in the Philippines!" As a practical mom, I don't encourage my family to purchase any kind of fire crackers. Recalling my childhood, I grew up with fire crackers by the street lit up by my brothers and my cousins. While me and my younger brother would each hold "luses" and "watusi." But being aware of the dangers it could cause, now that I'm an adult, a mom especially, I don't want my kids to grow up lighting up any kind of fire crackers. 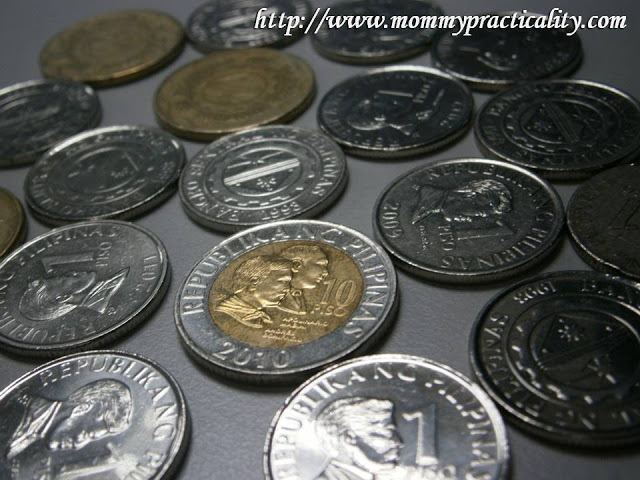 Coin Shower/ Putting Coins in Pockets - If you have coins in your pockets, you will never run out of money throughout the year. If you shower coins inside the house for the little children to pick up, money will never stop flowing inside your home throughout the year. Jumping at exactly 12 midnight - When little kids jump up and down, it should be as high as they could, at midnight, they will grow taller faster. 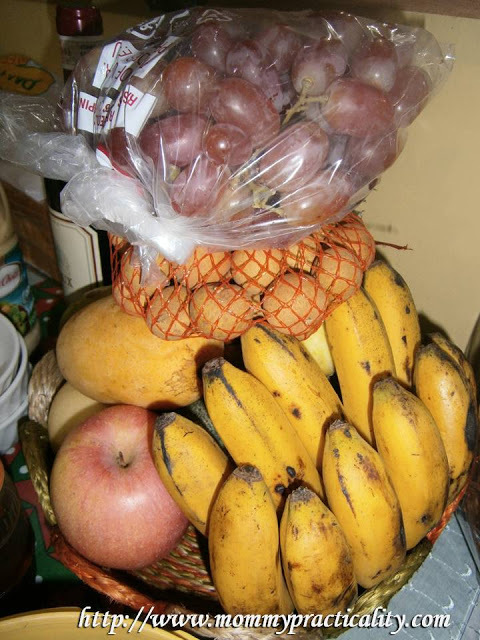 Round Fruits - 12 or 8 round fruits as the table's centerpiece still means prosperity and money for the family. Making Noise - This is the part where some use fire crackers. To be safe, we used horns or in Filipino "torotot" to make so much noise. Some play really loud party music to welcome the new year with positivity, glee and liveliness. Making noise they say also drives away the bad spirits so only positive energies will come your way. Media Noche - Media means "middle" while Noche means "night." Media Noche is a feast and a gathering of the whole family to welcome the new year in the middle of the night. Special dishes are served on the table to symbolize good living and prosperity that is wished for the whole year. 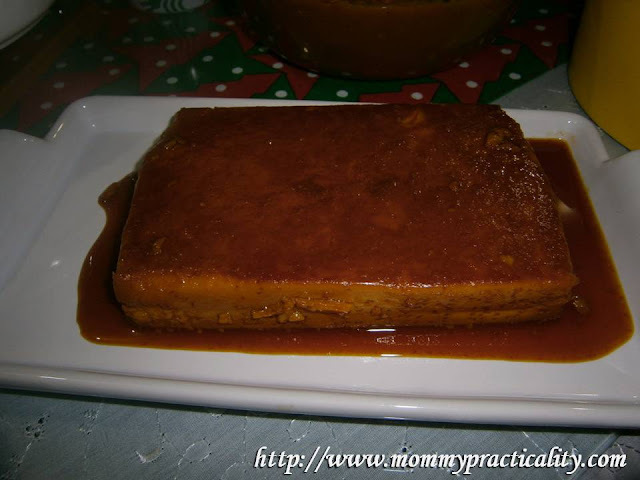 Serve "Malagkit" or Sticky Food - In connection to Media Noche, sticky foods should also be served. Eating sticky food such as Leche Flan, Halaya, Arroz Caldo or Congee, or Biko (Rice Cake) symbolizes a family that will stick together come what may. Filipino customs or traditions, but for some superstitions or fictitious ways, in celebrating the new year's eve is what make the family look forward to something exciting every end of the year. The children wait for midnight to watch these traditions happen before their very eyes. Even the youngest partakes in making it a joyous event. These traditions are what I want my children to grow up with and pass on to their own as well. Whether the round symbols mentioned above are true or not, there's no harm in keeping the traditions alive in all of our hearts. As long as the whole family is up for it and is together in celebrating this event, we would do it every year. What's important is, every new year is a new beginning, a fresh start, a signal of change and hope to be better for everyone. Happy 2013! From that list of what you did, we all did that too! We're traditional that way as well. But my mom redefines the 12 fruits by adding 1 more and letting us eat 12 grapes each at media noche. That's great to know Mys! :) Happy New Year! I forgot about the malagkit on New Year, but my brother in law came over and gave some! Happy New Year Louise! 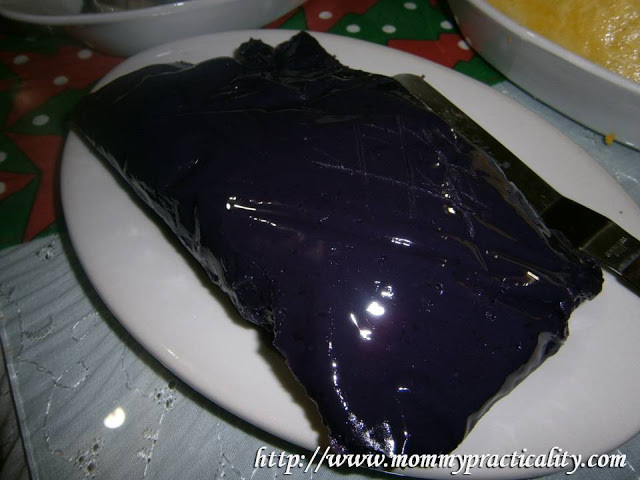 I used to cook arroz caldo every year except 2012, so we settled for yummy sticky leche flan and ube halaya. 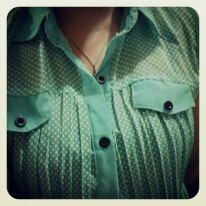 :) Happy New Year January! Wow, we have also done that. I wear my red dress with polka dots. Daddy also cooked biko, we had media noche with 13 round fruits on the table. I also kalog the alkansya of my son and it poured all over our house, haha... It is really fun celebrating New Year in the Philippines! Happy New Year too Max! i can still remember dressing up in polka dots and jumping up and down like it was yesterday. now my kids are doing it. we dont do the 12 fruits though. The last photo is ube right? Sarap! If given the chance I will really choice to go home in Pinas on December. Christmas and New Year. The best ang Pinoy food. And I want my husband to experience a different kind of New Year. Nothing beats being a Pinoy :D and though we veer away from the superstitious beliefs, our dining table abounded with round fruits. We had torotots too for my pamangkins. No firecrackers for us, too! This year I just wanted to celebrate it with family, but took no extra effort for the fruits,the polka dots, the coins! My sister-in-law chose the type of food for the night... we had shabu-shabu and barbecue! Really great hot soup since we were in the mountains and the breeze was cold! Wow! Shabu-shabu is love! :) Happy New Year! just like you, i am afraid of firecrackers i have not lit any one even before. I was thankful that hubby did not bought one last new year. haha! It's like I'm going to have a heart attack each time a fire cracker cracks! Wow...so just made me realized that I had missed a lot last new year. I hope that next year I get to go home on holidays and do everything you've listed on new years eve. Happy new year! Not being mean here and please don't get me wrong, but I don't believe that these practices will give us luck or something good in return. But not necessarily that I don't do these. It is for fun I think would be one of my reasons why I also do these. 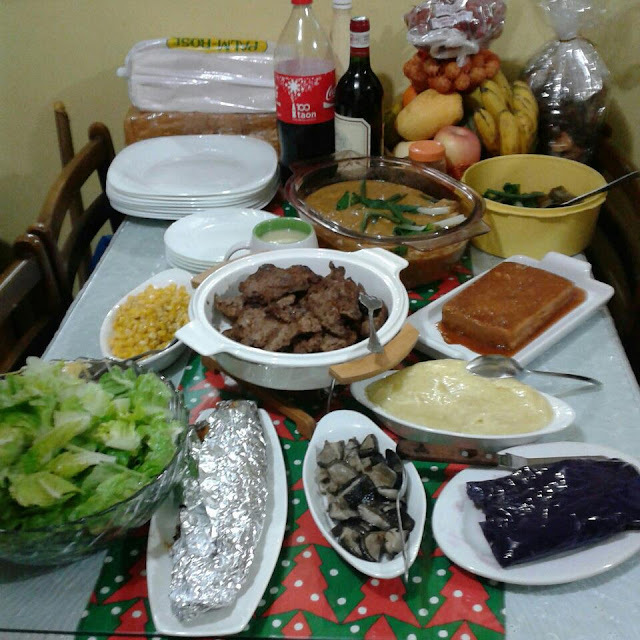 But to me, I consider celebrating NYE with media noche etc. as thanksgiving and nothing else. Love all the pix though. Happy family, good food and all. Such a blessing! Happy and blessed new year Louise! I don't really believe in luck or in lucky charms, but we bought round fruits, wore polka dots, and placed money in our pockets. Not because we believe they would bring luck, but because the traditions are great bonding activities! Same here sis! I just listed what we traditionally do and what I want to pass on my kids. Our fate still relies on the choices we make with prayer and work. Happy New Year! Happy New Year Mommy Loise! :) StayBlessed and Family!